We have bad news for jailbreakers & Cydia lovers. 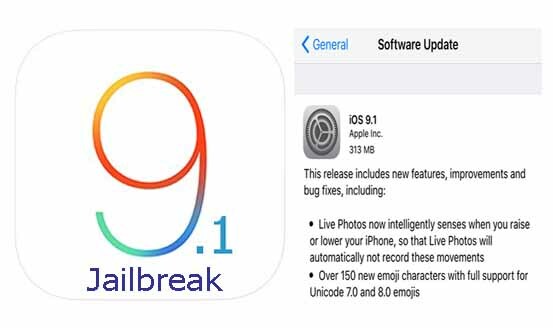 Apple has patched Pangu 9 jailbreak in just released iOS 9.1 firmware update for iPhone, iPad & iPod Touch. So, Apple has closed the gates for Cydia iOS 9.1. iOS 9.1 jailbreak is not achieved by the existing Pangu tools. Therefore, you are unable to Cydia download for iOS 9.1 latest firmware version because, Pangu 9 not supports to jailbreak iOS 9.1 at this moment. Pleases DO NOT upgrade your device to iOS 9.1 at this moment. Your loving Cydia is not there. iOS 9.1 jailbreak is impossible yet. If you already have upgraded to iOS 9.1, still you can downgrade back to iOS 9.0.2 as Apple is signing iOS 9.0.2. Then you allow to Cydia download for your device. You have to hurry, because Apple will stop signing iOS 9.0.2 at any moment. You are still able to Cydia download for iOS 9.0 – iOS 9.0.2 iPhone, iPad & iPod using Pangu 9 jailbreak. Not yet get Cydia for your device? Follow our tutorial to successfully jailbreak your device..
What do you think, Pangu jailbreak will update to compatible with iOS 9.1? Touch with us, we’ll let you know as soon as available..
‹ How to fix iOS 9 – iOS 9.0.2 Pangu jailbreak errors? How can I stop updating my iOS 9.1? It is not automatically update your iOS version without your permission. When the time it ask you to upgrade iOS version, you can ignore it if you don’t want. I need to delete it how do I delete it? Do you want to delete Cydia? Pangu 9 jailbreak successfully works with iOS 9.0, 9.0.1 and 9.0.2. Pangu 9 currently not supported with iOS 9.1 latest version. Pangu is free for all users. Any person do not pay to money to buy pangu, Cydia or anyjailbreak tool. Any matter comments to us. Do not waste your & our time with unwanted comments. How do i install cydia? I’ve tried everything and it doesn’t work on my phone. How do you downgrade 9.1 to something lower , I’m trying to activate cydia but can’t cause of this ….? You are no longer able downgrade iOS 9.1 to lower. Apple has stopped signing iOS 9.0.2 and lower versions. NOOOOO GODDARNIT WHYYYYYYYYY!!!!!!!!!! I need the jailbreak for 9.1 so bad because I’m in school and people figure out my passcode all the time no matter how many times I change it!!! NOOOOO APPLE YOU ARE A JERK!!!! We cannot say jailbreak tool release date. Please bookmark or share us..
please provide Pangu and Taigi for jailbreak ios 9.1….. please please. Currently Pangu or TaiG not available for jailbreak iOS 9.1. Please follow us on Twitter, like our Facebook page or add us to your circle on Google+ to get latest news update about Cydia jailbreak..
i cant see cydia icon in my phone screen i have apple 5s 9.3.1 how i can get cydia icon and make it work…? Cydia not support for iOS 9.3.1 now, Because jailbreak not released for users. Follow our guides properly. Be careful, Some sites are installing fake Cydia for iOS 9.3.1 this moment. We know, Many users are interesting to install Cydia for iOS 9.3.1. But they need to jailbreak device to install Cydia application. Jalbreak is one and only method to install Cydia. Please stay with jailbreak public release for users. Sorry for the delay. iOS 9.2.1 version unable to jailbreak this moment. Please stay until jb release to install Cydia. Wait..